Amanda Leo embraced the notion of helping people improve their everyday lives by learning, or in some cases, relearning, practical, meaningful skills. 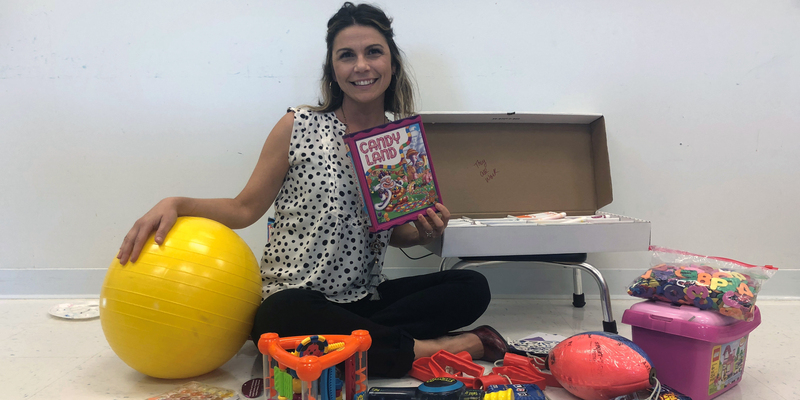 Don’t be surprised to walk into Amanda Leo’s college classroom and see Candy Land along with Twister and Bopit and some Legos scattered on the floor. Creativity is one of the chief reasons Leo gravitated toward occupational therapy as a career. She also embraced the notion of helping people improve their everyday lives by learning, or in some cases, relearning, practical, meaningful skills. As head of Tidewater Community College’s occupational therapy assistant program, she introduces a field she loves to students who feel the same way. One of her happiest moments — watching a second-grader she had worked with since preschool write her name for the first time. Leo has a mug sitting on the desk inside her office in the Regional Health Professions Center on the Virginia Beach Campus. It reads “Tears of my students,” in reference to just how emotional working as an occupational therapy assistant can be. Occupational therapy assistants work with occupational therapists to help their clients, who range from babies to the elderly, develop and recover activities of daily living. That might include getting dressed, brushing teeth and cooking in an older population. When working with children, the focus is often on developmental delays as they affect education. Leo’s use of toys and games in a recent lab was to demonstrate how play could be incorporated to promote appropriate motor skills and stimulate imagination. It’s the sort of hands-on activity students earning TCC’s Associate of Applied Science in Occupational Therapy Assistant can expect. Leo, a Duquesne University graduate, has been an occupational therapist for 15 years, with a pediatric background in early intervention, outpatient and school-based practice. She has served as president of the Virginia Occupational Therapy Association and presented internationally on the needs of children with disabilities. The same approach occupational therapy embraces – treating a person holistically – applies to how she treats students in the program. Occupational therapy often isn’t the first health profession people consider when searching for a first-time career or a career change. Leo initially thought she would be a nurse like her mother but her “no needles” criteria made her look elsewhere. She’s glad she found occupational therapy. Husband Tony is also an occupational therapist. The two met at Duquesne and have two daughters, Juliana, 11, and Addison, 8. Applications for TCC’s associate program that begins in fall 2019 semester will be accepted through March 19. Find information online or contact Leo at aleo@tcc.edu.